Finger Licking Food: Spicy Bean Soup – Comfort at its best! The temp has been dropping constantly over the past week and we are almost in the 20s…brrrr...the thought of going out makes me shudder! Nothing like sitting indoors, warm and cosy, curled up on the couch with a hot bowl of hearty, spicy, chunky soup. This one is sure to warm you up from within. Heat the oil in a heavy large pot over medium-high heat. Add the onions, celery, carrot, bell pepper, and garlic, and saute until the onions are translucent, about 15 minutes. Add the chili powder, coriander, cumin, oregano and crushed red pepper, and cook for 2 minutes. Stir in the tomatoes with their juices, tomato juice, tomato paste, and 2 tsp of salt. Add the broth, garbanzo beans, cannellini beans, and lentils. Stir in the zucchini and yellow squash. Bring to a simmer over high heat. Decrease the heat to medium. Simmer, uncovered, until the lentils are tender and the mixture thickens slightly, stirring often, about 20 minutes. Season the soup to taste with more salt, if desired. This makes a whole lot of soup, so unless you have company or a large family, I would suggest halving the recipe. 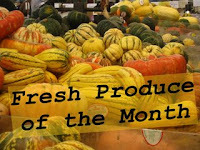 Spicy Bean Soup is my entry to "Fresh Produce of the Month : Squash" hosted by Marta of An Italian in the US. It looks and sounds really tasty. Perfect for a cold winter day. Thanks for sharing. I was sure that the 1/2 c of chilli powder was a typo until I read your note. That must've been a protein-rich filling soup. Thanks Sagari, try it, it sure was tasty. That soup looks so comforting...lovely. Its a lovely soup...but i guess i wont get some of the ingredients here..
i am planning to go on a soup-for-dinner diet and i am so glad there are so many soup recipes doing the rounds! I do agree nothing is better than a bowl of hot soup on a winter day. Thanks E, hmm yup, you might not get all of them in India. great on a cold winter day!! I am into soups these days...and urs looking so yummy nice and healthy!